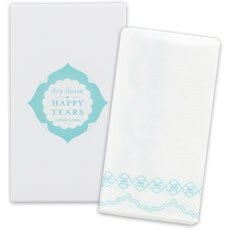 If there are any tears shed at your wedding, be prepared for them with our selection of novelty wedding favor tissue packs from Weddingstar. Choose from our selection of lovely personalized tissue packs and other unique tissue items that will help you celebrate your wedding day with charming details. Show your guests that you have indeed thought of everything with these wedding tissue favors.Offer our bride and groom tissue packs or other tissue pack options in baskets at your wedding ceremony and be ready for those water works to flow. You may also opt to add a single tissue as an insert into each wedding program for a sweet personal touch that will warm your guests' hearts. Check out our ideas and inspirations for ways to incorporate these goodies into your celebration.From traditional designs to modern and contemporary styles, our wedding favor tissue designs have something to offer just about every bride and groom's personal preference. 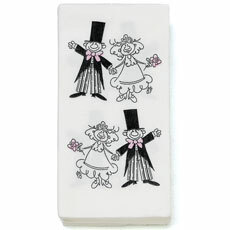 Choose from the Cute Bride and Groom tissue packs - these tissues feature a jolly, hand-designed bride and groom decked out in their wedding attire. This adorable couple is on their way to the chapel - with a pretty pink bow tie and pink flower accents.You may prefer our Bride and Groom wedding tissue pack favors with baby-blue accents contrasted on white tissues. 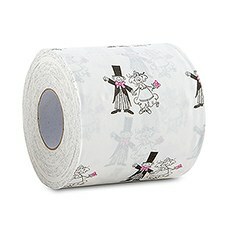 The "Bride" and "Groom" script is accented with a stylish top hat and dapper bow tie for the groom, as well as a bouquet of pretty blue flowers for the bride.Our Wedding Favor Tissues in Sea Blue print are ideal accents to any wedding ceremony or reception - encourage your guests to "dry those happy tears." 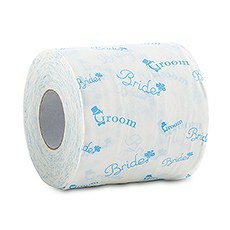 Each tissue has a lovely scrolled design that will add a touch of style and classic grace to your event.For a fun and festive tissue, opt for our light-hearted toilet paper rolls that feature the same happy bride and groom with the pink accents or the baby-blue "Bride" and "Groom" print. Replace the regular toilet tissue with these designs and you are sure to get a reaction from family and friends!It is easy to personalize these wedding favor tissue packs with the help of our customized labels, cards and other designs. See how Weddingstar can help make your wedding's details amazing.